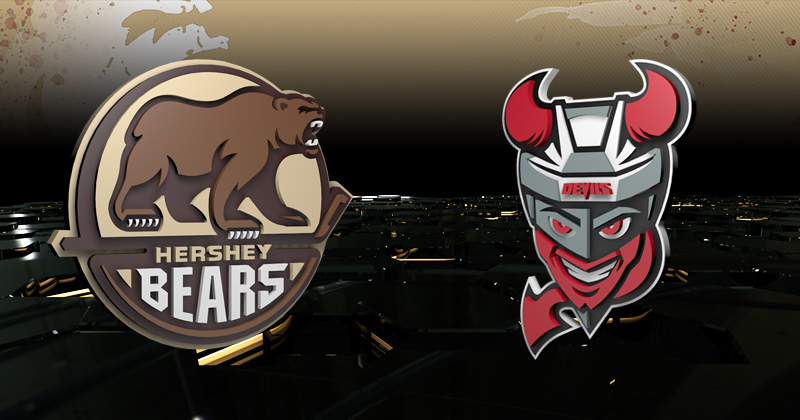 01/16/2019 - Tonight, the Hershey Bears battle the Binghamton Devils in the finale of their brief, two-game season series. Both teams are fresh off 5-4 wins from the previous weekend. The Devils enter tonight's contest on a four-game win streak. The Hershey Bears swept a home-and-home stretch last weekend against the Lehigh Valley Phantoms with a 5-4 win on Sunday at Giant Center. The Bears blitzed to an early 3-1 lead on goals from Nathan Walker, Liam O'Brien and Mike Sgarbossa within the game's first 6:36. After Taylor Leier and Connor Bunnaman tallied for Lehigh Valley to even the score at 3-3, Connor Hobbs scored at 14:29 of the second period to provide Hershey a 4-3 lead. Hobbs' scored his second goal of the season after finishing a one-time pass from Juuso Ikonen. Brian Pinho scored a key insurance tally only 1:53 into the third period, which later proved to be the game-winner. Pinho beat Alex Lyon on a loose puck left at the net front. Mike Vecchione brought the Phantoms closer at 18:34, but the Bears successfully hung onto their 5-4 lead. The Devils are also coming off a 5-4 win in their previous meeting, beating the Cleveland Monsters on Saturday. Marian Studenic, Nathan Bastian, Egor Sharangovich, Brian Ward and Nick Saracino scored for Binghamton. The Bears have enjoyed success playing in the city of Binghamton, dating back to the now defunct Binghamton Senators. Since the 2013-14 season, Hershey holds a 10-5-1-0 record in Binghamton between the Devils and Senators. Despite the recent success, Hershey's lone visit to Binghamton in 2018 ended in a 3-0 shutout loss on Mar. 10, 2018. Vitek Vanecek made 30 stops on 32 shots, but Devils goaltender Mackenzie Blackwood made 18 saves for the clean sheet. The Chocolate and White have put together an impressive string of strong starts, scoring the first goal in eight straight games. The Bears hold a 5-3-0-0 record in that stretch. Overall, Hershey has scored first 20 times this season, posting a 12-7-0-1 record when they notch the game’s icebreaker.